With the amount of times that I make this paleo banana bread, it is no secret as to how it's the most popular recipe on my website… EVER!!! Knowing this is quite humbling; and I just love that it gives people a delicious and HEALTHY option. This recipe has been turned into quite a few different dishes and I love hearing all of your variations. Comment below and let me know how you've spiced it up! Now it's confession time… this recipe was a delicious mistake. I was perfecting a paleo pancake recipe that is now in The Paleo Kitchen (page 95) and asked myself; “Why not Banana bread?”. Every recipe I have seen for Paleo Banana Bread has been loaded with nut flours and only one banana at that! The award-winning, life changing banana bread recipe. FREE forever!!! Newsflash, it is called banana bread for a reason; so I wanted to make it about bananas. And there was no better way then to throw four of them in here. So with that, I give you what I am naming my Paleo Banana Bread. Oh yea… the bananas don't even need to be overly ripe! You can have this recipe from ingredients to batter and in the oven in 5 minutes, or less. I timed it :) When you are finished baking, slather this in some grass-fed butter and drizzle with raw honey. Maybe add some cinnamon, some chocolate chips, some candied walnuts… the options are endless! Just typing this post makes my mouth water again. Time to get creative with some more flavor combinations to keep this recipe evolving perfectly. Hey, maybe I can even put together a free e-book on all the different ways you can enjoy this banana bread. Leave me a comment if that is something you would like to see, I will see what I can do. Go get your banana bread going now!!! And as always, enjoy! Interested in eating more healthy for life? Thank you for the recipe, very tasty bread. I just love baked goods, so I’m really happy with every recipe I find. the bread turned out very tasty, I was wondering, is it your own recipe? Delicious! I made it with dark cocoa powder and just a touch of maple syrup, since many complained it was bland. I am also happy to see from the comments that I am not the only one who forgot the coconut oil. (I left it in the microwave after melting… typical). It still came out with great consistency and amazing flavor! My husband couldn’t get enough of it. Lol! It’s amazing how many people can forget the coconut oil in the microwave! And I bet that tasted AMAZING with the cocoa! This is from the sun butter reacting with the baking soda/powder upon cooling! The reaction causes the baked goods to turn green! It won’t effect the flavor though! P.s. : how many Cards has one slice? I substituted butter with half coconut and half ghee to make it lactose free. My tips to the unhappy comments: Get bananas very ripe if you want it sweet! Don’t stir in the coconut flour too much if you want it moist! Made this today. Recipe works quite well, which I find can be an issue with paleo recipes. Fluffy and moist but not too fluffy or too moist. The only issue is a lack of flavor. Even after vanilla and banana. I may add a little honey, maple syrup or Truvia next time. Seriously amazing. I will definitely make it again. Passed the husband test, who isn’t paleo, but is when I do the cooking ;) Very good recipe. Added a bit of coconut palm sugar to sweeten as my bananas weren’t very ripe, and it was delicious! Ooh, yes! The husband test is a tough one, and it passed! Thanks for sharing (and eating), Nichole! This fell short of expectations based on the number of stars this received. Taste and texture lacking. It is passable with the addition of butter and cinnamon spread on top(and I think I know why several recommendations for toppings are included in the recipe). This one simply can’t stand alone. I’m sorry to hear it didn’t pass the test! We appreciate the feedback. Thanks, Nicole! Hi Beck! Do you have access to peanut butter? That could work too. Damper Go, Devil Dog! Making this morning. Keep it up. this recipe looks good, however i have a question. Why did you decide to put baking soda in it? what is the function? Among the ingredients i do not see any acidic one so the soda wont be able to serve its leavening function as it wont work. Or maybe it is not there for leavening? thanks! Not all together unpleasant in terms of taste but my word it was so so soggy! Mine went very dark in colour and whenever I took a slice I would have to squeeze it between a couple of pieces of kitchen roll in order to get rid of the…grease? I don’t know what it was. Just made this to incorporate into my first six week Paleo. The intent was to make it for myself and husband but kids ate it up too. Will try the pumpkin variation next time. This recipe is going in the recipe box. Thanks for sharing! I know, there’s usually always someone asking about substitutions. I am so incredibly hungry for something baked, but practically all recipes include eggs. I react to egg whites, so that takes care of that. So, my question is, can I just use egg yolks in this recipe instead of whole eggs? Like 6 yolks instead of 4 whole eggs? It doesn’t appear like you answer questions, but I thought I’d try. I think I can help here. I am sensitive to egg whites, too. I use the egg yokes and substitute the whites with 1/2 tsp ground chia or flax seeds to 2 tsp water per egg white. Mix the two and let them sit for 3 – 6 min. They goo up like egg whites. I use this method successfully all the time. Very good! My BF loved it too! I accidentally left out the butter. If you don’t have or don’t want to use butter or coconut oil rest assured it’s still yummy without it! Mine was plenty sweet. Just use very ripe bananas! Made this and like it. A few questions: 1. How do you store it? Refrigerated, cabinet, etc. 2. I noticed after a couple days mine got stringy stickiness. Does that mean it has gone bad? Did I not mix well enough? I’m new to Paleo baking. This is AMAZING! What a great snack for me and for my child. It was so easy to make, easy to clean up, and well, easy to eat. 100% will make again. Tried this today but used about a cup of almond flour in place of the coconut flour, as well as 1/4 cup coconut flakes, 1/4 oatmeal, and 1/2 cup chocolate chips. Came out great! Keep in mind it’s not very sweet since the bananas are the only sweetener; I liked it just fine but definitely appreciated the chocolate chips. Thanks for a great recipe. I’m finally making these this morning! They are amazing! Thank you for sharing such a great recipe. Can you do this in a breadmaker? This looks delish! Do you have a calorie count for this recipe? Great great greaaat recipe! Very moist,just as I like it! I made it and it was dangerously delicious! I like it more than the normal one. Thank you very much! Hi George, delicious recipe thank you!! Sorry was just wondering with the variations on the muffins, do you omit the banana from the original recipe when u add all the extras?? Thanks! Followed the recipe using almond flour. They sunk in the middle and are mushy. I tried baking them longer and they burned around the edges and are STILL mushy. Increase almond flour or use coconut flour. I was wondering if sweet potato or pumpkin would work since theyare lower in carbs and sugar? Hi, I made this yesterday and it is lovely and moist – thanks for sharing! The only issue is that the bread is quite fragile and broke apart when cutting into slices… any ideas where I may have gone wrong? The only way I strayed from the recipie was using crunchy peanut butter and I did have to use 7 medium bananas to get 2 1/2 cups. Thanks! Can I sub Cassava Flour for the coconut flour? This is absolutely delicious! Even better when you add chocolate chips in it (half of a cup of enjoy life, dairy free chocolate chips). Am I the only one who had realized after the fact that the ingredients call for baking powder, which has cornstarch in it? Also, its ok for a paleo banana bread knockoff, but still not the real thing. I use grain-free baking powder. The brand name is Hain. Ingredients are monocalcium phosphate, potato starch and potassium bicarbonate. The ratio is 1:1 with the average baking powder. Anyone tried this with banana flour rather than nut or coconut? Omg this is so good! I made this tonight and it turned out amazing. Made this today. Followed exactly. Added chocolate chips for the kids. Huge success. This will be a staple from now on. Quick easy. Kids inhaled. Thank you! Sorry – my previous note had an error! Should be 1 1/4 tsp of baking soda to go in with the mashed bananas (not 2 tsp), to replace the baking powder. You can still make in a blender, just let the mashed bananas rest 5 mins before adding the rest. Definitely has the right flavors and texture. I’m just missing the sweetness of regular banana bread. Good recipe though. We, and I mean the family just went Paleo as of the 1st of Jan. Not really a New Year resolution… just felt it was time to change the diet. I am the cook around this homestead and I cook just about anything, so this is really a change for me. With that being said after quite a few baking recipes of one bread or another, this is absolutely the best yet. Next round I will use very ripe bananas for added sweetness or just go ahead and add some coconut sugar. I made this awesome bread several times without being able to get it out of the pan. After watching the Great British Baking Show I saw how to use parchment paper. I line the entire pan to get it to work, and it is perfect. Also, I separate the eggs, adding the yokes at the beginning and setting the whites aside. When everything is mixed, I then beat the whites until stiff peaks form, and then fold the whites into the batter, for a beautiful, light bake. Followed the recipe to a t, substituted coconut for almond flour and just some general feedback for those using almond flour instead of coconut, you’d need closer to 1 cup of almond flour. As is, it was way too moist. Coconut flour behaves much different from almond flour, it’s way more absorbent. I made a similar mistake substituting almond flour with coconut flour once and my muffin batter turned out so dry, I had to add liquid to it to even be able to stir it. So if that’s the only reason you gave this recipe 3 stars, maybe it’s worth trying it out literally to a t.
I know it wouldn’t technically be paleo anymore, but would using peanut butter instead of almond butter work for this recipe? yes but peanut butter is one of the most toxic butters, they are loaded with aflatoxins that can really irritate the gut. Love this recipe! Would you suggest refrigeration of the leftovers? If not, how long can this sit out? Have made and enjoyed many times before. This time, on the 3rd day, there was a greenish hue in the bread inside one corner throughout loaf. Not mold (no fuzz), cannot figure it out. Perhaps a chemical reaction? Only modifications I made were adding ground ginger, clove, and using some tahini and some sunbutter mixed. I haven’t had much luck finding paleo muffin recipes that I like but this one is awesome! Thank you! My 3 year old just ate two of these (basic recipe, muffins) and asked for a 3rd muffin! Definitely a keeper! love it keep em coming mom! I had a brown banana windfall and saw the link to your recipe on fannetasticfood.com, so decided to give it a whirl. I made it exactly per the recipe and stuck it in the fridge overnight. Just had a slab this morning with breakfast and it is really good. Nice texture, moist, just sweet enough. Thanks! Can I sub the eggs for flax eggs? Not quite sweet enough for my taste (or my little guys). Great texture though! Next time I’ll experiment with adding honey…1/2 cup? 1 cup? Did you use super ripe bananas? I would experiment with 1/2 cup of honey. I have not tested this but let us know if that works better for you. AWESOME recipe! I had a LOAD of “ripe” bananas from my BF, so decided to try 2 different best paleo banana bread” recipes. This one takes the cake! Thank you! Hello. I too am knew to the Paleo diet. Is it normal for the bread to be “spongy”. The bread taste amazing. It is very different in texture than I am used to. Paleo baked goods will have a slightly different texture than conventional ones made with wheat flour. So healthy and delicious!! Thanks for the great recipe. Hi George – in your orange cranberry version it says to use the “zest of one whole orange diced” – is that just the zest or do you also use the flesh of a diced orange? Thanks so much, been using this recipe A LOT. Also have used your BBQ crockpot chicken recipe quite a bit. I live at 7,000 feet in the Mountain West. Do I need to alter anything in this recipe because of elevation? Thanks. You may have to adjust the time or temperature but I have not tested this so I’m not sure how much either way. Please let us know how it works for you so we can share for any others living at higher altitudes. Gabriela. Hiiiiii. I live at 8600′ and even though I have the scientific equations for high altitude and several cookbooks on it, I find that using extra large eggs or an extra egg works wonders. Muffins about same time and temp but I go with slightly lower temp with extra time. Good luck to you! I make this recipe regularly adding 1/4 cup honey, walnuts and craisins and bake as muffins. I throw one in my lunch box every day for breakfast. Great recipe – thank you for sharing! That’s great! It’s a perfect grab and go option. Great recipe, thank you. I replaced some of the banana with dates, replaced the butter with coconut oil and used sprouting brown rice flour (pantry-induced improv) and it was still totally delicious. I actually prefer it to my usual cake recipe! Awesome! Thank you for sharing your tips. Hi Rebecca – I’m curious – how many cups of dates did you replace per each banana? I’m a Brit so I don’t use cups but I used about 4 – 5 medjool dates for one banana. Hope you like it / it works well for you. I just made this and it turned out perfectly! I used 5 bananas, 1/2 C coconut flour, scant 1/4 C almond flour, and added some honey and it was perfect! It’s not letting me rate it as 5 stars, but I would give it 5 stars! Hi George. What size pan do you use? Forgive me if I missed it. Thank you! Hello, I made this delicious recipe quick and easy just following the directions. I used a glass pan about 9″in diameter it worked out fine. I made sure to grease it up well. It turned out really good and especially right out of the oven! Can I make this batter ahead of time and leave it in my fridge for a few hours? I’m worried that the butter will harden or the baking time would have to be longer… Thoughts? In my experience with baking cakes, my butter has never hardened inside the batter when refrigerated. However, if you bake with cold batter, it doesn’t rise and becomes really dense. If you refrigerate, bring batter to room temp and mix again to incorporate air back in. And remember, bananas will brown in the fridge. So don’t be turned off if the color changes. P.S. I tried giving 5 stars, but it’s only showing 4 ? it won’t let me change it. WOW. So much yum. For the last couple of years, I’ve been making a paleo banana bread that I love, but it has honey/maple syrup in it. I’m trying to eliminate or at least reduce my use of sugar (incl honey, which seems to be in so many paleo baking recipes), for the sake of my diabetic husband. Just made this and it is a HUGE hit with the whole family (including my preteen sons, who are usually suspicious of anything paleo). Thank you for a fabulous recipe! Has anyone tried this without the baking soda? Has anyone tried to add vegetables (zucchini or spinach perhaps) to this recipe? Would I have to alter other proportions? Has anyone ever added any veggies (zucchini or spinach perhaps?) to this recipe? I want to make this for my son but also want to get some vegetables in there. Any suggestions? I have not tested this. I’m sure you could easily add zucchini, just make sure to squeeze out as much liquid as possible. Please let us know how it turns out if you try it! Are the nutritional values available? 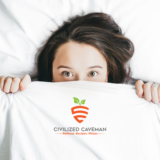 I don’t provide nutritional information on my site but I do offer it on my app, Caveman Feast, or you can use a site like my fitness pal. If I leave out the baking powder and just use the baking soda, is it going to rise at all? I am not allowed baking powder on the GAPS diet, even if it is home made. I have not tested this so I don’t know how that would come out. This is by far the BEST paleo banana bread I’ve ever made and it’s so simple. Not rock hard, dense or dry like all the others I’ve made. I added some Enjoy Life chocolate chips and it’s the perfect snack. Thank you! It’s great with chocolate chips! Glad you enjoy it! What is the best (and safest) storage method for preserving this. You can add what you want to the recipe for variation but do not take away! The base recipe stays the same. Would this work with tahini instead of nut butter? I was out of almond butter the first time I wanted to make this, so I subbed Justin’s chocolate hazelnut butter. Winner – chocolate banana bread! My kids even love it. I found it easy to place my blender container on my kitchen scale and tare it, then weigh out the ingredients as I add them to the container. Can I substitute coconut butter for the almond butter? I just made the banana bread. I substituted the almond butter for earth balance because it didn’t have almond butter. It turned out running, I use almond flour with some coconut because last time I used coconut flour it didn’t bake. It just fell apart. Any replacement idea for the nut butter. I have recently started following paleo diet. I saw this recipe and knew I had to try it! I plan on making it tomorrow, but I have a couple of questions? Is any store bought applesauce considered paleo? And if I added a few tablespoons to the banana bread for more moisture, do you think it would go well with the ingredients? Thanks! Do you by chance have the nutrition info for this recipe? I’m going to make the muffin version and would like to add it to my macro count. Thanks! It’s the same thing, just clarified butter. That’s a weird question. I’ve tried this recipe 3 times, following it exactly, and each time it is completely squishy in the middle. This time I even left it in the oven for an hour and 20 min, and it’s burned on the outside, and still squishy in the middle. Any thoughts as to what the problem could be? I’d love to have a paleo banana bread. mine did the same even though I added more coconut flour but I didn’t have a scale so I wasn’t sure how much to use without going over board. I am not sure what 75G is equivalent to cup size. I think you need to add more flour because I did and it took a little longer to cook but wasn’t squishy and was really tasty afterwards. I want to make this recipe but I am wary of wasting time and ingredients. How can it be coconut flour OR almond flour at the same measurements? Both of these flours act VERY differently in a recipe and cannot be subbed 1:1. I’ve done it with both and it works great! I use a mixture of both. It was an accident the first time. I ran out of coconut flour and only had a little over a quarter cup so I filled the rest of the half cup measuring cup with almond flour. It worked great! Now I do it every time. I make these muffins at- least weekly. I cant have eggs, would this work ok with flax eggs? yes i would like to try with chia or flax eggs….anyone know if that works or tried it? I made this with ripe plantains instead of bananas and used coconut oil all the way; the other ingredients and processes remain the same. The outcome is delicious, I can’t believe how light and sweet it is. Thanks for an awesome recipe. Perfect, moist, just sweet enough and delicious. If you’re having trouble with it being too mushy I suggest actually measuring the amount of banana you use. Banana sizes vary and the recipe is very specific about quantity. It only took me 3 bananas to reach 2.5 cups. Will be making this a ton in the future!! Would you happen to have the nutritional content of this recipe? Mine came out beautifully, thank you! I did have a little discrepancy, though. I weighed and measured the coconut flour just to see what the difference would be and there was actually a big difference between the two. The 75g of coconut flour was about a quarter cup more coconut flour than just a 1/2 cup measured in a dry measuring cup. Maybe that’s why some people had trouble with soggy bread? Just a thought. Thanks! I just made this and it is so awesome. I can’t stop eating it lol. Thank you for the recipe!! I love to throw in walnuts too! Silicon is an element. Silicone is the anti-stick rubber stufff. Oh. my. I made this exactly as written, then added just a little pure maple syrup. Just a touch. So good! This is a keeper. Awesome recipe! Tried it today. I used coconut butter because that was all I had and I use ghee instead of butter. BTW I forgot to add the vanilla and it was still awesome. Can’t wait to try it with the vanilla. I served it with a Thermomix made ice-cream of blended frozen fruit (bananas, berries, mango, kiwifruit) and plain greek yoghurt. Yum! I tried this recipe exactly as described and it came out so mushy in the middle! What went wrong? I was sooo excited to eat it. Toothpick came out clean but I tried flipping it over onto a cooling rack and the middle fell out! Cooked 10 minutes longer and still had mush. Super duper brown on the sides/top. Thoughts? What are the nutrition facts? Calories, carbs, etc? Made 16 muffins with this recipe. Baked @350 degrees for about 27 minutes–took it out sooner because the tops were getting too brown and the tester came out clean. Used coconut oil; added raisins for added texture and sweetness. The muffins were moist and spongier than expected, but held its shape. I will enjoy this for breakfast! Thank you for the recipe. Someone brought this to a work luncheon and it was the first thing to disappear. The recipe flew around our office and I’ve made it many times. It never lasts more than a few minutes. I wonder how long this keeps in the freezer? Great recipe! I’ve done it twice and both times it came out great. My kids love it. The second time I did half almond butter and half coconut butter. I added cacao nibs on the top. Delicious! Love the texture. Moist but not mushy. Thank-you for sharing this recipe, the whole family(children ranging from 4-14) just love it, which is a first! What is the nutritional calculations? I need to know the carbs. I tried this recipe and the only change I made was I used almond flour instead of coconut flour. I was worried that it may taste more like coconut that was why I changed flours. Mine came out kind of mushy as well. It was really wet and I couldn’t stomach that texture. Any recommendations?? Thanks! I have never heard that, and you added coconut flour? Mine always come out mushy too. Just made a batch tonight, mushy. I’m thinking there’s too much melted butter! And yes, I use coconut flour. Will try half the amount of butter next time. I’ve read on other food blogs that certain coconut flour doesn’t come out very well. I think off brands, and the one in the green bag,Let’s Do Organic coconut flour, come out mushy, when used in recipes like this. PS This delicious recipe works perfect in the microwave tried it loved it. this is an awesome recipe so accurate simple yet flavorful I added a 1/4 cup of raisins used half coconut and half almond meal flour and it was wonderful. If you substitute the coconut flour for almond flour, does that affect the recipe? I know coconut flour absorbs a ton of moisture where almond flour is not quite as absorbent; I’d be worried it may turn out too moist. Anyone try that variation? Thanks! This really is awesome. I made it last weekend. I’m thinking of making the muffin version but I like the moist interior as the best part, so I guess the muffins would have less of that…decision, decisions! ;) Can’t wait to try it with Coconut Butter (I used peanut butter first time). Thank you for this recipe! This recipe is so good (but I did burn it slightly as mine is a fan assisted oven, I needed to reduce the time ). If I put wall nuts in do I have to reduce any of the ingredients? I made this recipe and everyone in my household thought it was a hit! I used alomnd butter and I added some fresh organic blueberries, it was so delicious! I can’t believe it’s gluten free! Just wanted to say thank you so much for sharing this great recipe! How about a variation such as lemon poppyseed? Any ideas? I love this recipe. My banana bread came out perfect and it was the first time I have made bread. I love that it is not too sweet, did not have to add honey. I also substituted almond butter for peanut butter as I could not find any peanut butter. You are so welcome, thank you for leaving a comment! I have made this recipe as muffins several times. So convenient for a take-along snack. Taste even better on the second day. I have a question on the variation suggestions. Do you omit the bananas when making the variations or add the other ingredients as well as bananas? Amazing recipe!! Finally, I can indulge in eating banana bread without any guilt. I am definitely making this again. It’s rare that I find a healthy recipe that appeals to the whole family, but this one hits the spot. I made the pumpkin-pecan version, and added a few tbs of sugar-free chocolate chips. Not only did I love it, but so did my 11-month old, my 4 year-old, my 7 year-old (who is super picky; he has autism and the food aversions that go with it, AND he doesn’t like bananas because of the texture), and my husband (who didn’t know it was paleo). Thanks so much for my new go-to banana bread recipe, it’s the tops! I love this recipe! It’s easily my favourite go-to paleo treat. I always use ground almonds instead of coconut flour (because it’s waaaay too expensive here in France) and it’s just perfect. I was wondering if it freezes well once it’s cooked or if it goes a little weird. Any thoughts? This was the best paleo banana bread recipe I have tried! I am always looking for paleo versions of my favorite treats, and this one was tops. I tasted it when it was cooled off, and I thought that it tasted like “regular” banana bread. This is a great resource for reliable recipes that taste amazing. I made this with applesauce instead of banana and it was awesome! I added two eggs and 2 tbsp extra of coconut flour to the mixture as well. AWESOME!! Question, is the g measurement for the bananas with or without the peel? Thank you! Mmmm! I just made this and it’s lovely. I made a few changes. I didn’t have nut butter, so I ground up 1/2 c of almonds and added a little extra coconut oil. (I used coconut oil instead of butter.) I added an extra banana just so I wouldn’t have an extra one hanging around and added a T and a t of coconut flour. I also doubled the vanilla and added orange flavor too. I also added a dash of maple syrup… and I confess that I added some chocolate chips… So okay, not exactly paleo, but close enough. I LOVE this recipe. I have made it so many times and the best part is that it never fails! I have tried a few different flavours too! My favourite is home-made chocolate hazelnut butter. Thank you! Hi, George. Thanks for acting on your thought, “I want bananas in my banana bread!” I just tried it and made myself stick to your original recipe — SOOO GOOD! And no additional sweeteners! I’m tempted to go right back in there and start trying variations. You may have guessed by now that my answer to your question about whether an e-book on this bread and its variations would be a good idea: an unqualified YES! I only almond flour on hand. Can it be substituted for the coconut flour? Absolutely glad I came across this recipe. Nothing bad in it and tastes awesome. I make it every week. Maybe you should try using riper bananas? If you use really ripe bananas it turns out super sweet and the banana flavour is off the charts! Made these as muffins today with the coconut oil and a 1/2 cup choc chips and baked for 25 min – they were perfect. I will try the cocoa powder next time for the chocolate version – thanks so much! I have made this several times and feel compelled to share a few things…. I have made this with almond butter, but usually I omit the nut butter due to allergies in the house and find that it works just fine! I think the texture ends up slightly different, but nobody seems to notice. Lastly, I attempted a pumpkin version of this where I used 2 bananas and 1 c pumpkin puree. I enjoyed them BUT I am now of the opinion that anything that uses bananas as a base will taste at least a little bit like banana. This goes for some banana-based brownie recipes I have made too…..not necessarily a bad thing, but if you are not expecting it then it might disappoint you! In conclusion….definitely most forgiving recipe ever! I ve tried this recipe many times and it worked well :) just curious if i make it in muffin pans how long do i have to bake it ? 1/2 cup coconut flour equal to 75 gr ? i read it was 56 gr. which on is true ? Fresh out of the oven. I had such high hopes, as it had risen so well over the 60-minute bake. The taste is fine, not as banana-y (even with using very ripe bananas) as I’d hope with a slightly eggy texture. Definitely a good base to toy around with. I’ve been saving this recipe for a long time and have finally made it. It’s just awesome and plan on baking regularly. Haven’t looked through every comment but I’m wondering has anyone tried to freeze a loaf? I bake one weekly and cut it up into individual servings to freeze and it works perfectly. I’ve never frozen a whole loaf though. After making this a few times and always having trouble with the bottom sticking now matter how much oil I used, I tried using a cut-to-size piece of parchment paper on the bottom of the pan. I still greased the sides and it still stuck, but I was able to loosen it with a spatula/flipper and it slid out no problem. I also made an adjustment for our high altitude here in Calgary, AB. I increased the coconut flour to 3/4 cup and it solved the ‘gooey’ issue I had before. Thanks! Great recipe!! I always add dark chocolate and sometimes walnuts. I have been looking for a good recipe … I have been training hard. I have been seeking a healthier lifestyle. This recipe was good, but I found that it came out a but eggy ( I know that is not a proper word). I used almond flour in mine, perhaps I need to add more much like how you did. Awesome recipe! Been searching long and hard for a good, healthy one. You’ve certainly delivered. Thanks! This is the first time making a paleo banana bread and it was simple and very delicious. I did not make any alterations to the original recipe. However the most upsetting thing is that it did not keep for long and let’s just say that throwing away my HALF loaf was heart breaking considering how expensive the ingredients are (I live in an area where these ingredients are hard to come by). It was only 4 days. My advice would be to put it in the fridge straight away if you live in a humid area like myself. Asia is not the best place to leave a banana bread on the counter for 2 days. It just tasted very funky unfortunately. @CookingCaveman – please make this a note at the end of the recipe to warn others. OH wow, I would never leave it out but thanks for the tip. Can I use peanut butter instead ? I’ve made this so many times and absolutely love it! I got distracted today and added almond flour instead of almond butter…but then a threw some in once I realized my mistake. I’m hoping it turns out okay…crossing my fingers while it bakes. Just tried the Banana Paleo bread and its just beautiful.. I love this guilt free delicious way of cooking so thank you for sharing your recipes with us!! I want to try the pumpkin version. Do I omit the bananas or reduce the bananas? If leaving the bananas in, does it taste like banana pumpkin? I don’t really want to taste the bananas in the pumpkin version. Thanks. Oh my goodness! This was the best ever! We have been slowly making the transition to eating paleo/ real food and this delicious bread gives me hope for the future! Thank you so much!! I was cleaning the batter in the bowl before baking. It tasted so sweet and good, cannot wait to taste the end result. Love the simple recipe! Best banana bread I have made. Have just gone paleo and really surprised how much flavour this recipe has. I made this last week but didn’t watch my oven temperature and bread was slightly burnt on outside, though inside was lovely and moist, still very delicious. Have just made this again. Turned oven temperature down (as I have a fan forced oven) and cooked for 50mins. I would definitely recommend this. I will be trying some variations as well. Even my husband who is rather sceptical about my new way of eating, was impressed. Thank you. How many calories in one portion of the banana bread? This looks delicious! Could I use oat flour instead of coconut flour? YES It works with Oat Flour- I use 1/2 C Oats ground in the food processor and 1/2 C Coconut Flour or You can use 1- 1 1/4 C Oat Flour.. I also subbed the Almond butter w/ Almond meal one time too !! So, quick question: What loaf pan do you recommend to get a reasonably similar conventional bread size? Would a 9×5 work fine? Or would it be too thin? And obviously, I CANNOT wait to do this! It’s messing with my will in unknown ways! Tried this out a while back and love it! I store it in the fridge to keep and also because my house is REALLY warm in the spring/summer and some of fall since I live in the valley. I used a glass loaf pan because my luck in the past with the non stick has been awful! I also put down a small sheet of parchment to make the loaf pop right out of the pan because I hate losing half of the loaf to it sticking! haha! But very yummy and MOIST! BEST Paleo Banana Bread recipe! I followed it exactly and it turned out moist and delicious. Even my hard to please MIL, hubby, and picky kids gobbled it up! Try this recipe in an eight inch pan, top it of with a side of maple syrup… DELICIOUS! Has anyone ever tried to make it in a bread machine? I am looking for a good paleo banana bread that I can make in a bread machine. Why? Paleo breads are so easy they are actually easier than taking the time to use a machine. Mix wet. Mix dry. Blend. Pour. Bake. Straight up 10 minutes or less. I tossed my bread machine. It made simple things more difficult and time consuming. No point in something that is superfluous. Hope you find something that works for you. I tried this recipe using sunflower butter instead of almond butter and I noticed that within a day (or less!) the bread starts turning blue/green. It’s happened twice now, once when I left the loaf out of the fridge, and once when I had the loaf in the fridge. Could it be the sunflower butter? Or maybe it’s normal when using coconut flour (I’ve never used it before). That all said, it TASTES amazing. Fascinating, thanks for your insight! Really good, best grain-free baked treat I have had. It may have been covered somewhere else in the lengthy thread of comments, but I found the toothpick test is not a good determination with this recipe. Toothpick came out clean as a whistle but it was still gummy in the center of the cake. The flavor and texture of the cooked parts are fantastic!! Double thumbs up. George, I have a serious question! I am on the quest for the PERFECT GF/DF banana bread and I really thought this would be it. My bread came out SUPER dry and with not enough flavor or sweetness. Comparing to other recipes, it doesn’t have any honey or coconut milk (things that would make it sweet and moist). I also think the bananas I used weren’t ripe enough. But any other suggestions for me??! I am desperate! I just made this recipe and had the opposite problem! I followed the recipe, cooked for 60 minutes in a silicone pan – and it was still watery! It hadn’t cooked at all. I know my oven works because everything else I make works. This is the second GF banana bread recipe I have tried, and the last one turned out exactly the same. These recipes without regular flour don’t seem to work. I also notice you don’t use any xanthan gum, which other GF recipes use – although it didn’t seem to help the other recipe either. Any suggestions? Did you by chance use almond flour instead of coconut flour? That could explain your problem. This recipe is great if you use coconut flour, but contrary to what the recipe says above, almond flour and other nut flours CANNOT be substituted directly for coconut flour–they behave completely differently in recipes. Coconut flour absorbs a ton of moisture, whereas the other flours do not. So if you use almond flour, it will turn out a watery mess. I used almond flour(Bob’s) and this recipe turned out perfectly, moist, tender, delicious. Toasting it adds another tasty dimension. After you add the coconut flour, continue blending the ingredients (this works best with a hand blender) for a couple extra minutes until you notice the batter start to thicken up. It is impossible to over mix this batter, so mix until you are satisfied that the coconut flour has absorbed a lot of the liquid before baking. That should help with the wateriness. I made this and I didn’t have enough banana. 300 g. I sustituted dates ( mashed up of course) until I gad 575. Baked in an 8 by 8 for 40 min or so. Absolutely delish and super moist! If you make the muffins do you think they would stick to muffin liners or just bake without them? They peel off paper liners without a problem! Seriously the best banana bread ever. I was getting so pissed because every banana bread recipe had added sweetners… hello, banana is SO sweet already! What were these people thinking?! Thanks for your creativity. DELISH. Just made your recipe (Banana Bread). I doubled it!! I had to be careful because I ran out of room in the food processor. Mixed dry ingredients in a separate, bigger, bowl then combined the two. Made my own Almond butter. It turned out awesome!! I made two sets of muffins and one loaf. Plan on freezing the muffins and use as needed. Thank you very much for providing such great healthy recipes!! Isela, how much Almonds did you use for your butter? I either make too much or too little. Also, what kind of Almonds do you use? I standardly get raw Almonds. Holy smokes, this is an amazing recipe. I just finished my first Whole30 and opted to stay away from Gluten but was really looking to try out something bread-y. I was nervous my first GF baking was going to be a flop, but this turned out perfectly! It was so easy that I plan to keep this one in my reserves to serve for friends or to take as a dessert to pass. The texture is truly perfect, dense and moist without being heavy and the flavor is very similar to traditional banana bread without being quite as sweet (which I love!). First I have to say thanks for such an awesome recipe, I don’t usually bake but steps were easy to follow and turned out amazing. Just a few questions, I doubled up the ingredients to make a double batch, is there any change to the instructions? Also, I noticed after a couple days the bread (stored in tupperwear) became very very moist and had a very bad after taste. The day before it was great, not sure if there is a certain way I should be storing this? It doesn’t store long. When doubling I would just assume the baking time would be different, just cook until done. Store it in the fridge, and freeze any amount that you won’t be eating within a few days. I’ve made this several times as muffins, and I find that I can just pull a frozen muffin out of the freezer, microwave for 30-40 seconds and it is warm and delicious! I’ve never commente on a recipe before, but this one was just too great! Ive made this a couple times now, each time splittig the batter into two variations. Ir made plain, with golden raisins, with tons of fresh blueberries mixed in, with dark chocolate on top, in a loaf pan, a silicone muffin pan, and a small square pyrex. each time turned out great (even the batch where forgot the coconut oil!) I always have over ripe bananas in my freezer, and this is by far the best use for them I have found. My husband also loves it, and now he thinks I’m an amazing paleo baker! i made this today using the pumpkin variation. The bread was not sweet at all and dry. Not sure what went wrong but will not make this recipe again. Most of the reviews were for the banana bread original recipe so I thought the pumpkin variation would be great as well. I will keep searching for a great paleo pumpkin bread recipe. ive made the pumpkin variation numerous times comes out perfect every time hands down my favorite one! OUTSTANDING. I still can’t believe that there is absolutely no sweetener in this recipe. It has such a great grain like texture, one of the BEST paleo recipes I’ve ever tasted. Thank you! I’m about to make this recipe! I’ll be doing the blueberry variation but with chocolate chips. Making this for a “before the club” party which I’ll be providing paleo food for my girlfriends! Made this and added 1/4 cocoa nibs for added texture. In a silicone loaf pan baked for 60 min at 350F – awesome! My husband just ate 1/2 loaf. Also made it a 2nd time using 1/4 gluten free baking mix for my kids and this looked almost identical to my regular banana bread loaf. Thanks for the great recipe! As I was preparing the batter (only substitute was 1/4 cup of clarified butter since I was down to 1/4 cup of Almond butter in the pantry)I was doubtful this was going to be as tasty as “Nana’s” Banana Bread recipe that had a bit of sweetner in it. I Baked it for 45 mins in a 9×9 pan. Golden brown on the outside and just a touch mushy on the inside. Turned the oven off and placed it back in the warm oven..went visiting for an hour or so and when I returned…perfection! Sweet is not the problem. I think the problem is the loaf pan..too deep for this recipe leaving uncooked interior. Use a shallow pan. Light, Fluffy and DELICIOUS! Thank you so much. I love your descriptive words, makes me hungry. Loaf pan isn’t problem…ensure you use the convection (fan) setting if you have one and use a high quality silicone pan…no need to grease pan and totally consistent baking times. Loafs, no matter what the ingredients, usually take from 55-65 minutes if filled 3/4 full or more. I have been making all sorts (even flourless) for many years. Hmmmm….your oven may not be heating to true temperature. try 75 min and check for burning (maybe lower one shelf level down so slightly lower in oven as heat will come from bottom for baking). Let me know if this solves problem. I’m curious and may try on a non-convection setting too. Thanks! I have the same problem with a lot of my banana breads but find if I cover with foil for the last 15-20 minutes of baking it cooks thru perfectly. Made these today and they were amazing. My kids said they were even better than my “regular” ones (and they are hard to please). Opted for muffins after reading the “black on the outside/raw inside” comments regarding the loaf. They were perfect- brown and moist, not spongy. Cooked for 30 minutes. Also added 1/4c of shredded coconut and 3/4c of dark chocolate chips. Can’t wait to make again. For healthy it was pretty good and guilt-free. I just added some jam for added sweetness. I used the coconut oil instead of the butter and it was moist and fine. Thanks! This is an unbelievable banana bread. I loved it had no added sweetener- let the bananas do that! I added some semi-crushed walnuts on top and also broiled it for a few minutes after it was finished baking to crisp up the top! I followed the exact recipe and it all just came out wet and not at all cooked, even though the top was almost burnt. Like a very wet sponge that tastes like raw eggs. Did you by chance use almond flour instead of coconut? That’s the one thing I would say about this recipe… almond flour and other nut flours CANNOT be substituted directly for coconut flour. They perform completely differently in recipes. Coconut flour absorbs a lot of moisture, whereas almond flour not only does not absorb moisture but actually adds moisture to the recipe. So if you use almond flour for this, it will be a watery mess. I need to clarify my previous response. I was cooking several things this morning when I decided to try this recipe since I had very ripe bananas. As I was cleaning up I saw my measured out coconut oil that I forgot to add to the mix. That being said the bread was very crusty on the outside but mushy on the inside. It probably would have still been a fail. I cooked it for 50 minutes trying to get it to dry out. I used Bobs Coconut Flour that I had on hand. The texture seems like baking powder not flour. Any suggestions on another type of coconut flour to use ? Oh I never use bobs because it never turns out. I always use the Tropical Traditions brand you can find here. FAIL: This was looking beautiful as I removed from oven, inserted knife that came out clean, flipped onto a cooling rack expecting it to slide right out but it would not be coaxed out of the greased glass loaf pan. I banged the loaf pan with large spoon, then went around the edge with a knife, and finally it came out with a dry blob and all the crusty goodness still stuck on loaf pan. Absolutely wonderful! I followed the recipe exactly (but had to make my own almond butter)and it worked out perfectly. The fact that it has no sweetener is huge along with the fact that no one will know. Can’t wait to make the orange cranberry and pumpkin ones. Thank-you! I melted 1 T butter and about 3 oz. dark chocolate and swirled that in which came out the oven looking beautiful and tasted great. However, a couple minutes out of the oven and it sunk in the middle. Any idea how to prevent that? Did I take it out of the oven too soon? Just chiming in here to say that the bread can be made without the almond butter, just add an extra banana!! It worked great, thanks for the recipe! Just made this bread.. I love how simple & quick it is to prepare! It has a very good flavor, but mine came out very “spongy”, so I’m trying to figure out what I did that can be adjusted next time. I used almond flour, sun butter, 5 bananas instead of 4 because they were small bananas. Everything else I did according to recipe. I used a glass pan & baked for 50 mins… so possibly undercooked? The knife/toothpick came out completely clean when I tested it & the outside def looked done. Any suggestions? Hello from the paleo baking community, please: I followed the recipe, and used homemade baking powder & sunflower seed butter from Trader Joe’s. My “test” loaf came out black on top, and green underneath that. The taste is fine, but I bought a lot of bananas to make several mini loaves for gifts… and I’m not sure what I need to do to avoid that, as it is not very appealing. Thanks for tips! Oh, there is an almond shortage, so I could not buy any almond butter. Baking powder and sunflower seed butter react with chlorophyl and turn it green. That’s how we make St Patty day recipes in the Paleo world. It is completely fine. Haha, thanks George. Today is round 2, and I’m prepared to try again. TJ’s got a shipment of almond butter, & I am stocked now. So hopefully this time it won’t be green & black. Has anyone tried the pumpkin pecan version? How did it turn out? Pumpkin pecan is the only version I make now! It’s so good. I add pumpkin pie spice too, and make into muffins. Really good! I used coconut butter and aded some bittersweet chocolate chips. First time I’ve baked something without adding sugar or a sweetener of some sort and it came out great! Highly recommend. I’ve made this banana bread several times…..turns out perfect everytime and it is fantastic! I have an egg sensitivity. What can I use in place of eggs in this recipe? Did you try applesauce as an egg substitute? Or anything else? I am trying to make this AIP-compliant..
Chewy, moist and delicious! My boys love it! Love it and feeling healthy too!! Didn’t have almond butter, used peanut butter instead. Turned out great. Glad to see a receipe with no sugar added. So glad you loved it Katie. You should definitely try it with almond butter and avoid the peanuts as much as possible. Check out this article Mark’s Daily apple did. AMAZING! I never comment on recipes I find online but this is a different story. When I make banana bread I always want to use more bananas than the recipe calls for and when I saw this one uses four bananas I wanted to try it. So glad I did! Best banana bread I’ve ever had. Yes, better than the stuff my mom made with regular flour and shortening. My fiancé has so many dietary restrictions and we could both eat this together. Love the low sweetness level. Perfect as is but I might try adding more spices next time just to experiment. I’ll definitely add ground clove, ginger, nutmeg, and allspice when I bake the pumpkin version. Can’t wait! Thanks a million for creating this gem. Very good! Surprisingly light and moist. I freeze overripe bananas, so I used five small frozen bananas. For a topping, I mixed cinnamon, granulated maple sugar and chia seeds and added the mix to the top and swirled a bit throughout (I used a bundt pan). I made this without almond butter, but subbed 1/4 c coconut oil in its place. Absolutely perfect! Though I’d like to add that I used a metal pan and it STILL took 55 minutes to bake until the middle was set, so I was a bit confused by the 35-40 minute calculation. Will definitely make again – maybe muffins next time! Enjoyed your recipe. I left out the vanilla and still good. This is the best banana bread I’ve ever made, paleo or no! I didn’t have really ripe bananas, so I added a tablespoon of molasses and one and a half tablespoons of xylitol to make sure it would be somewhat sweet, since my kids would be eating it. I also didn’t have enough sunflower seed butter- it amounted to about 1/4-1/3 cup I think, but it didn’t seem to make a difference. It was very moist and delicious. I will be keeping this recipe, with my modifications- I’m not changing a good thing! I also followed another commenter’s suggestion to avoid it being mushy- they used 8″ square baking dish, which I don’t have, so I used a small rectangular (about 10×7 I think). Thanks for this recipe!! So delicious that even non-paleo’s would love it I’m sure!! The texture of the bread is the absolute best of any paleo recipe I have tried. Based on comments about mushiness and firmness, I baked it in an 8 inch square dish, reducing the cook time to 45 minutes. Turned out perfectly! It is not sweet, which is great because it allows for a little versatility by spreading on a little fruit or honey. LOVE it! Made these into muffins today – totally forgot the almond butter but consistency is awesome and taste is wonderful! So easy, thanks! I don’t think I was paying enough attention to how much mashed bananas I added (mashing bananas is FUN). As a result it never firmed up enough. Still, it was very delicious. I had coconut flour and bananas to use up but am vegan. Substituted coconut oil for the butter as the option and flax seed eggs with a little extra baking powder and it was so delicious. The texture and flavor are awesome! You are right so quick too! They were more flavorful when they coolled though. My sis & I made this today and we love it. Thanks! This is advertised as non-dairy but how is butter, even if it is grass-fed, not dairy? This recipe is GREAT! I drizzled with honey right out of the oven! I made them into mini muffins; cooked 19 minutes at 350 degrees (probably should have pulled at 18 or so, but still amazing). It makes me feel like I’m eating a normal banana bread, but no guilt! Great job! Thanks for the recipe! Made the banana cake today. Tastes great and the texture is good. Chewy and soft. I have tried many other recipes but THIS recipe is by far the best!! So delicious! The texture, the flavor are on point! I’m so excited about this recipe! Thanks for this wonderful recipe! I have made it four times in the past week as my family love it and it disappears within a day! For the last two loaves, I have added 4 Medjool dates and a teaspoon of ginger which I think is a lovely variation. I just made the pumpkin version and it is a nice flavor but I could only really eat the outside edge, the rest is mushy :( I used almond meal, and a bit of coconut flour. I also used 5 black slightly firm refrigerated only bananas, should I have done something to reduce the water here? Or maybe lose an egg? I guess back off a banana? it only came to 2 cups when my immersion blender got done with them. Anyway, very excited about the flavor, kinda bummed about the texture I created. It should be known I am no hand in the kitchen, so any tips will be very appreciated. Made this last night and loved it. Though I added an extra banana, choppedd up, to give it little bursts of moist banana flavor. Made the banana bread 3 times now. It is delicious straight out of the oven. It is delicious when cooled down. It never lasts long in our house. 5 stars (It won’t let me rate it). I made the Pumpkin Pecan version of this recipe and it was honestly the best Paleo desert I have found! Even my non-Paleo friends loved it! Is the variation on top of the existing banana bread recipe or is it instead of bananas? This recipe is by FAR the tastiest banana bread I’ve ever made! I’ve just converted my whole office to paleo :) thanks! Has anyone ever tried using frozen bananas? I want to make this recipe but don’t have enough bananas. But I do have a bunch of frozen slices I save for smoothies. Any thoughts on if this would work? I used 1 fresh banana and 3 previously frozen and thawed, and it turned out great! I drained about 1/2 of the liquid that had accumulated with thawing. Used 1/4c coconut flour and 1/4 c almond flour (to equal the required 1/2c, not extra) and a good handful of pecan pieces. Yes, I’ve made this with frozen bananas and it works! Love, love, love… Making a second loaf tonight, after my kids inhaled the first one over the weekend! Fantastic. :) Added a smidge of honey and soy butter on top while it was still hot. I’m going to take this loaf to work tomorrow. Thank you! Thanks for the recipe. I added 1/2 cup of flaxseeds and substituted the baking powder with 1/4 tsp. baking soda and 1/2 cup grass-fed whole buttermilk (could use yogurt). It came out great! A good dose of fiber too! With my substitution 1 serving of this recipe has: 15 grams of carbs, 9 grams of fiber, 10 grams of protein, and 21 grams of fat. (8 servings, although that was a lot of bread for me so I would make the servings smaller). And a little too carby. I was thinking of substituting the banana with zucchini and sweetening with a dash of honey next time to see if I can get those carbs down. Anyway, thanks for the inspiration. George I know you do not calculate carbs for your recipes. But could someone tell me how many carbs are in this recipe? I cook for a diabetic that has to keep to a certain limit on his carb intake daily. I calculated about 15 grams of carbs (I only used 2 cups of banana instead of 2.5). I added flaxseeds so that brought the fiber up to 9 grams. That is in 8 servings. Total carbs were about 150 grams, fiber 70 g, protein 80, and fat 172 for the whole loaf (rounding up a little). Again, that is with 1/2 cup flaxseeds, 1/2 cup buttermilk, and 2 cups of bananas…everything else the same. This is fabulous! My kids are not fans of our new paleo-style diet but they actually loved this bread :) I was geeked! It came out fluffy & moist for us. I baked in a cake for about 20 minutes. Yum! Ok, so I admit it has been a very LONG time since I have had “real” banana bread so if you are comparing it to the real thing, then you might be a little disappointed. However, if you are like me and have grown accustomed to the texture of coconut flour and egg in baked goods, then you will love this recipe. I used grass-fed butter, really ripe bananas, high quality organic coconut flour, as well as cashew butter. I thought it was plenty sweet with just the ripe bananas but once again, I haven’t eaten sugary snacks in a long time. I also upped the vanilla to a tablespoon and added some nutmeg and all-spice just b/c I love how they add a warmness to baked goods. Once baked, I topped it with a little extra cinnamon and butter upon slicing right out of the oven. Delish! This recipe does come out like a sponge. Hope this works out better for others! I have tried making paleo banana bread before and it always comes out spongey. I am tempted to try this recipe but dont want to waste good ingredients. Is there something I can do to ensure it will not turn out like a sponge? I would have to agree. I’m a little new to Paleo cooking and will have to get used to that texture, I guess. Flavor was a bit bland, too. I’m not sure I understand how this is a 5 star recipe. Are all Paleo baked goods spongy? You can either freeze it and save for later. Or, if you plan on eating it all, then store it in the fridge in a bag or sealed container. Just pulled this out of the oven, it’s perfect! I baked it for 35 minutes in a 7×11 glass dish. I have all the ingredients ready to make the recipe… (I’ve got a tonne of bananas that need using) but I can’t find anywhere to buy any nut butter around here… currently in a very small town in the north of italy. Is it possible to replace the nut butter with another ingredient? maybe oil or tahini? Unfortunately no. The recipe will not turn out the way it was intended to. My husband isn’t a fan of nut butter so as a substitute I used dates. I heated the dates in a saucepan with a little bit of water than added the baking soda to it. The soda breaks down the dates so that they are like a paste. I used the equivalent of dates instead of the nut butter and it worked (and tasted) great! You could always try making your own nut butter. There are many recipes on the internet. I just made the paleo banana bread. Actually I am having a piece now for dessert. For me it needed some honey in the batter. But when I put honey on the warm cake it was just delicious. What would you recommend for next time, honey or coconut sugar? Everything I have made from the cookbook has been wonderful. I am so glad I purchased it! I would stick with the honey. I am so ashamed. I just made a pig out of myself. Daughter brought me a muffin made from this banana bread recipe last night. It is gone, secretly scarfed down by yours truly, and I have never tasted better, including my own family favorite(a wonderfully moist recipe that is non-Paleo and also completely non-diabetic friendly). I do not bake it anymore for that reason. She admitted to one adjustment, adding some stevia to the recipe. We are now planning a Paleo Banana Bread and Pumpkin Pecan bake-off at my house. Hopefully by then I will be able to practice more restraint. For now, I am excited to view your other recipe adaptations. My blood sugar thanks you George! Love this recipe, thanks! I made as muffins and used egg replacer instead of eggs. I put a few frozen rasperries in the top of each muffin before baking and they turned out great! Mine was nice but a little too moist and eggy. Can you use 2 or 3 eggs instead of 4? It didn’t taste eggy but texture was a but like an omelette. I used half coconut half almond flour in mine. Just made this recipe today, and it was wonderful! Coming from someone who made/ate banana bread regularly, my picky hubby and I thought it tasted just like traditional banana bread. We are new to paleo, and we intend to make it a lifestyle, it’s recipes like this that help curb that occasional craving for bread or deserts. Can’t wait to share some with my diabetic mom, I think she’ll appreciate the high fiber and low carb content! Wow! I made this banana bread a cpl of hours ago and just had a piece. It was so yummy. I am new to Paleo so finding recipes that I actually like is reassuring. Thank you for this and other great options. Hello, I tried this recipe yesterday for the first time. Lovely flavors, looking forward to trying the other variations. Hi! Just a question. Is it possible to sub the nut butter with PB2 powder? If so, can I use the powder alone or does it have to be rehydrated to 1/2 cup with water? I don’t really make room for substitutions like nut butter. It would be a different recipe if I did. Sorry! They didn’t come out as sweet as I had expected it to be, perhaps because I used thawed frozen bananas, but hey I’m not complaining because they were still so moist and yum! I have a mediocre blender and my hands… think I can pull this off? This recipe is delish & so easy to make! 10/10! Very yummy though mine was more like a pudding as it was very moist. I think it just needed a bit more flour. This recipe plus 1/2 cup more almond flour (other half being coconut flour), and almost 1/2 cup of honey made twelve perfect muffins after 15-18 minutes & the tops are nicely risen and cracked to paleo perfection. Thanks so much for such an awesome recipe – you can truly tell the quality of a recipe if it still goes well after a couple adjustments! So I don’t know what went wrong but my banana bread was very oily I followed the recipe but I used coconut oil, maybe that’s why :( … Still pretty tasty! Perfecto!! A little moist but fantastic. I was wishing that I had added sunflower seeds – I think next time I will leave out the cinammon and add sunflower seeds! Just made these, absolutely delicious! So happy to have discovered a grain free bread that I can bake at home so easily. Thanks for the great recipe. My version was to throw everything into the food processor out of order, (also used half coconut and half almond flour) and then bake in a mini muffin pan. They turned out amazing in spite of my haste. I also forgot the vanilla but can’t tell. No need for any sweetener either. This recipe is a win all around! Five stars but the rating won’t let me :/ ! Hi! Made the bread this morning – – delicious except when I turned it over to get out of the bread pan, a 1/4 of the loaf broke and didn’t turn out of the pan. What is the trick? Let it cool longer (I had it cooling for about 20 min)? I did prepare the pan with coconut oil first. I would let it cool longer, and also line the pan with parchment paper with ends coming out the top/sides so you have enough to grip and pull it out with. As much as I wanted to love the recipe, I was disappointed. The flavor is good but I had to cook it for 1 hour 20 minutes and it was still moist. I want to try it again. Would using overly ripe bananas be my issue? Should I only use ripe bananas?Should I add more flour? Help :-). Yes, that can be dependent on a few things. If you used almond flour and the bananas were too ripe than there is nothing to absorb that excess moisture which is my guess on what happened. I always recommend using coconut flour first in this recipe because it turns out perfect every time. If you use coconut flour and your bananas are overly moist you can adjust from 1/2 cup to 3/4 cup at the most. Absolutely LOVE this recipe! Made them into muffins and ‘mini loaves’ in a square brownie pan. My fiancé can always tell (and dislikes) when I use coconut flour but he approved and even requested another batch. Thanks again!! I don’t like coconut, but was going to try this recipe tonight. Good to know there isn’t a strong coconut flavor to it. Just found this recipe today loved it! I’m trying this right now! It looks delicious on paper. I’ll let you know later. So I’m a dingaling and put almond flour instead of almond butter in it. It actually worked ok. Just FYI. You could try, but it’s really best to make it with the whole egg. I’ve made this recipe 4x in the last month. Can’t get enough of it. My 3 YO loves it!! Can you use frozen bananas? Would I just add more coconut flour due to excess moisture? I wouldn’t try it with frozen bananas as that would change the texture, and vary the cooking time. I made this with four frozen bananas (all I had) and it turned out great! Just FYI. Just made this into muffins! Tastes soo yummy! Only thing was I used sunflower seed butter since I was out of almond butter and it makes the muffins come out super dark and they almost look burnt( still tasty! Great recipe! Next time I’ll use almond butter! Just got done devouring this. Made it with crunchy Almond Butter because that’s all I had. Amazing, moist and delicious! I had a serious banana bread craving, hadn’t had any since going paleo about 2 yrs ago, and these did the trick. We added blueberries and walnuts to make it extra super yummy. Tasted like the best banana bread ever in my book. And my 3 yr old who has never had banana bread (and LOVES bananas and blueberries) thought they were the best ever too and would have gobbled up the whole loaf if I let him. We didn’t have almond butter, so just put in a 1/2 cup almond flour and a 1/4 cup organic white rice flour (yes, not exactly paleo, but great resistant starch!) and skipped the coconut flour, it never sits well with me and is kind of tricky to work with. Turned out great! Almost too sweet, with 4 ripe bananas, maybe I’ll try 3 next time. Have to make it for the hubby when he is home from a work trip, cause this one isn’t gonna last! What a treat. I make this bread often, and it is delicious! When I make it with sunflower butter, the top turns very dark and doesn’t look appetizing, but it tastes good. For this reason, I prefer almond butter. I really like the cinnamon and sometimes add walnuts. My toddler loves it as well. Thank you! Thank you! Happy that your toddler loves it too! I love this recipe! Quick and easy and my girls love it. I confess I put chocolate chips in though, but that’s because I have a thing for chocolate. And sometimes I add coconut, sunflower seeds, and raisins. I’m waiting for them to bake right now, because that’s supper tonight. Just had a go at making the Banana Bread. Disaster! The oven was far too hot so the bread was burnt on top, yet the mixture spattered out everywhere when I tried to turn it out. Very expensive, very messy and I’m very sad! Oh no!!!!!!! I’m sorry to hear that. Did you cook it at the recommended temperature? What went wrong? just made a loaf using 1 banana (all I had) and 1 egg plus 1 tblspn of chia seeds with water (so not technically fully paleo) didnt use the additional butter just the coconut butter and added in mixed spice, chopped dates,coconut syrup instead of honey and some vanilla extract. Tasted truly amazing. Great recipe! Glad you liked it Helenbeee!! I LOVE this recipe, easy and delish! I was wondering though could I sub 1 banana for some fresh pineapple for hummingbird cake/bread version? You wouldn’t want to sub Pineapple for the Banana. The Pineapple is watery, without the banana in there it will not hold together well at all. Adding in some fresh pineapple might be the way to go. Let me know how it comes out when you try it! I just made this recipe this morning, and baked in regular-sized muffins. Like many other posters, I also used half coconut flour, half almond flour. For the bananas, I used them from the freezer (we peel and freeze bananas that are getting too ripe). I added a cup of frozen blueberries and 1 tsp almond extract, plus an extra tablespoon each of coconut and almond flour to compensate for the added moisture. I also added half a cup of sliced almonds and used an additional half cup to top the muffins. We ate them with honey butter, because I was unsure if they would be sweet enough without any sugar in the recipe; they were delicious, but I think they would have been fine without the honey butter. That sounds SUPER delicious. Try them next time without the additional honey and let me know what you think! This is SO delicious. I took a loaf to my construction site and it was gone in 5 minutes – no one even realised it was grain free!! And so thrifty to make too. Do you think this would work with pumpkin in lieu if bananas? It would need some sweetness, but want to be able to make something when bananas are unavailable (or have too large a carbon footprint to justify). Can you sub the butter/oil with Apple sauce? That sounds delicious! Love raw honey. Made as described but too moist/spongy! Hmm that is strange. I’m glad it still tasted good. In my experience coconut flour is much more absorbent than almond flour, so that might have something to do with it. I made the recipe with Bob’s Red Mill coconut flour and it is very tasty. Added a bit of nutmeg, because I like nutmeg in my banana bread. Thanks, George – I’ve been looking for a good grain-free banana muffin recipe that doesn’t use sweeteners. Am going to have a delighted husband when he gets home! Hi, George! Thank you for this really great recipe! I just have one question. When you talk about variations, for example, the orange/cranberry, do you then need to leave out the banana completely? Maybe this is a silly question :) thanks! I made this banana bread loaf and my family loved it. My kids can be really picky but this was a hit!. I’ve even made muffins using this recipe and they came out great as well. This is the banana bread recipe for us! Thanks you for sharing. You’re so welcome… glad they enjoyed it! I used half coconut half almond flour and put some cacao nibs. Ran out of almond butter so i put about 1/8 cup of peanut butter (I know not paleo but that’s all I had)Delicious! Next time I will make as is. Do you have any suggestions on how to store this? I am baking it tonight to be served for brunch tomorrow and I want to ensure that it doesn’t get too soggy in the fridge. Any advice? I would cover it with some press n seal and leave it in the cupboard over night. Made this yesterday & I love it. 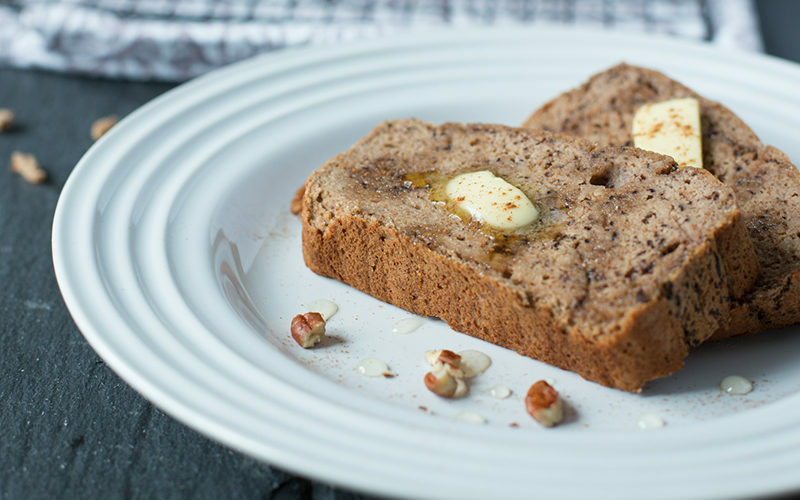 This is the most delicious paleo banana bread recipe! I can’t stop eating it & will definitely be making it my go to recipe. This was really good. I ran out of butter so used half butter, half coconut oil. I also added fresh small chunks of pineapple, so increased the flour to 1/2 (used 1/2 tapioca and 1/2 coconut flour). I had a little batter left so decided to make a muffin and it is delish, too. Thanks for sharing. This is a keeper. That does sound AWESOME. Love the idea to add pineapple chunks. 2 1/2 cups bananas is a ton for only 1/2 cup flour. It did come out toooo mushy. I will use less banana or more flour next time. Taste is one that new Paleos will have to adjust to, for sure. This recipe is amazing! I love it and can’t believe it doesn’t have any sugar! I have made this bread far too many times to count and it is fabulous as is. Today I made half the recipe and added a scoop of vanilla grass-fed whey protein and reduced the coconut flour by one tbsp and folded some chocolate chips into the batter. I poured it into my bar pan and got six finger-licking protein bars! Can’t wait to share this one with friends. That sounds AMAZING. What a great idea and a perfect snack! Which protein do you use? I use Kaizen Organic New Zealand Whey Isolate in Vanilla! Love this recipe! Any variation for zucchini? You are right. Life changing! I have been on a quest for the perfect banana bread recipe for years. The fact that it’s Paleo makes it even better! Sorry Mark Bittman- I’m breaking up with your banana bread. Hahaha thank you so much :) and I’m sorry to Mark. Delicious! My daughter loved it…great for snacks and breakfast. We have made this bread so many times we have lost count and love it! I especially love there are no added sweeteners, it just doesn’t need it. I’m not Paleo, but I have been gluten free for 6 weeks- this is the third banana bread recipe I’ve tried and by far the best! Made the original recipe, but used peanut butter and added half a cup of chocolate chips. Baked as mini muffins, they were done by 15 minutes. My kids and I loved them fresh out if the oven, and I suspect they’ll be even better tomorrow. We’ll definitely be trying the variations! Quick – can strawberries be added to the bread? I have a lot on hand and no idea what to do with them and I happen to be making this tonight. I am assuming I would need to blend them with the banana mixture but I’m not sure if I need to do anything else different, or if it would even work. Any advice would be appreciated. I tried to find anything about strawberries in the comments but there are so many it is tough. you can look it up on apps like my fitness pal! There is a great Australian site, calorieking.com.au, that you can put all the ingredients in, nominate portions sizes ie 12 slices in a loaf, and it will tell you. You have to sign up, it’s a function of the Daily Food Log, but it is a great site to have on hand. It would be of benefit if entering whole foods, not American branded stuff, as it only has things available in Australia. It never seizes to amaze me how many US recipes list specific branded items. When we cook from scratch, that’s what it is, from scratch. Rarely do you see things like tinned pumpkin or packaged pie filling. We only just got Betty Crocker icing in a can relatively recently. Tomato passata would be the exception. That’s why I’m loving these paleo sites – whole foods! !